Reposted from a previous blog of mine. With the berry season on at full blast, whenever you visit a store or a super market there are boxes of fresh berries on deals. We have been having our fill of berries-- strawberries, blueberries, raspberries, cherries. Even though I love my berries, just eating them as fruits is getting a tad boring. To bring back the zing into my berries, I wanted to make an easy desert with one of them. I have never made any desert with any of these berries so it was time to try something new. A quick research threw up thousands of possibilities, it was mind-boggling. Some recipes were easy, some pretty complicated, they all looked great yet did not feel like trying any of them. 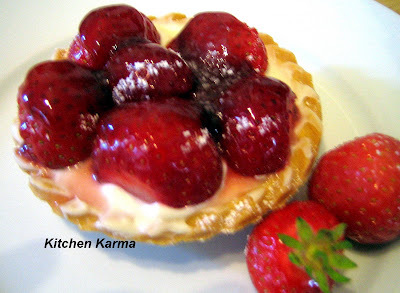 assembled the easiest yet lovely strawberry tarts! (I am sorry, I cannot find the youtube link any more, will post it once I can trace it.) Now it has become a regular in our menu! Chop the strawberries into two or four pieces (depending on the size of the berries) and set them aside. Arrange the tart shells on a serving tray. In a mixing bowl add the mascarpone cheese, the sugar, the vanilla extract and a pinch of cinnamon powder. Mix this well, till the mixture takes on a consistency of cream. Fill in the tart shells with two table spoons of the filling, spread it evenly with the back of your spoon. Then arrange the strawberries on top of the filling. In a pan, put in 4 spoonful of red currant jam and 2 table spoons of water, bring it to a boil and mix it thoroughly. Let the mixture cool down, with a paintbrush glaze the strawberries. Once glazing is done, dust in some icing sugar and little cinnamon powder. You can also use mint leaves and almond slivers to decorate. Voilà your tart is ready. Either serve this instantly or keep it in the fridge till your guests arrive. Goes really well with chilled white wine! This looks cool, ideal for parties, very delicious..
Just served these to some friends..it was a great hit!